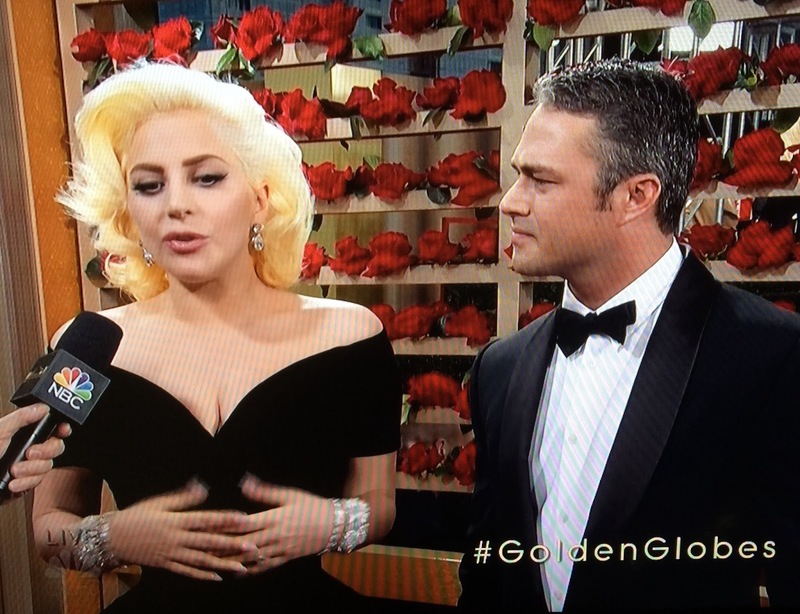 The 73rd Annual Golden Globe Awards RANT! I HEARD YOU MISSED ME, I’M BAAAAAAACK! Hello followers, friends, and fans. It’s been a long time since I’ve RANTED – life got in the way – but now I’m here, and hoping that this show is good! I haven’t had cable for many years now because Time Warner Cable IS A MENACE and became a luxury I could no longer afford, so I’m telling you now that I probably won’t know a lot of the shows and people who will be nominated this evening because now we LIVE IN THE FUTURE, so it’s not just “The Big 3” and HBO – there’s Starz, Netflix, USA, Showtime, YouTube, Go Pro blah, blah, blah – what a world. Anyway, the show is on NBC – (I heard that they don’t have ANY SHOWS that were nominated, which sounds crazy) and they wised up a few years back and have their own red carpet thingy –thankfully – because I can’t watch E! Oh, look at that striking blon…waaaaaaaait a minute – IS THAT LADY HOO-HAA? Zowie! She’s come a loooooong way baby. 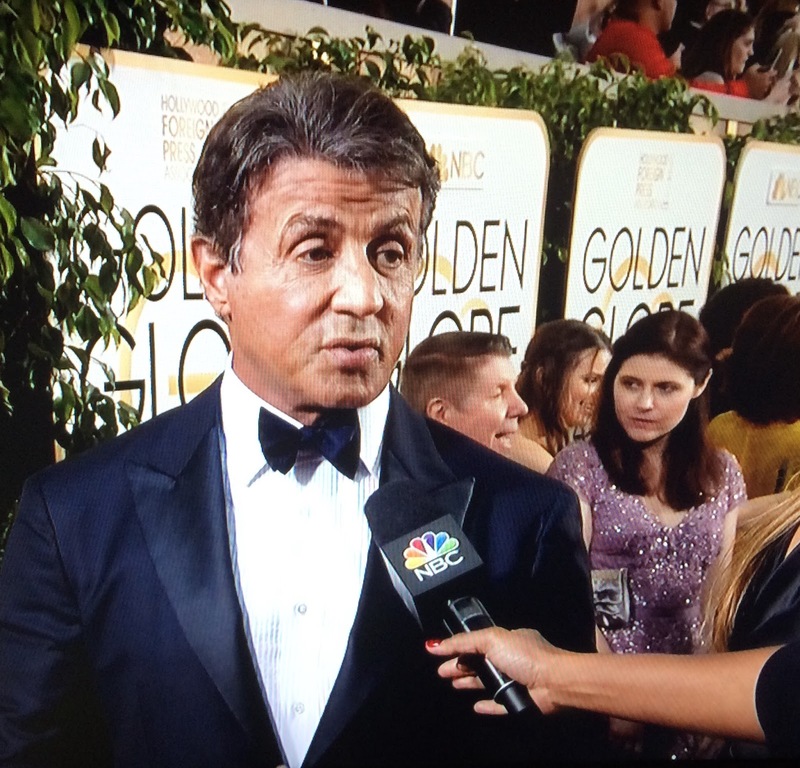 It’s Sylvester Stallone! And it looks like he’s seen Mickey Rourke’s plastic surgeon…and Donald Trumps makeup Artist – yeeeeeowch! Oh, look at that girl who’s on that NBC show that’s a ripoff of the movie Memento! Notice I can’t remember her name at all, but I do know her character on the show is chock-a-clock with tattoos, ha! Anyway, here she is in a really AMAZING DRESS (the skirt part) in one of my favorite colors without a bra on, being interviewed by another NBC flunky I don’t know. Here’s the first award – BEST SUPPORTING ACTRESS IN A FILM – Kate Winslet – for Steve Jobs. BEST ACTRESS IN A COMEDY SERIES – Rachel Bloom for Crazy Ex Girlfriend. I’ve heard of it, but have never seen it. Apparently it’s a musical show, or something. Boy was SHE excited to win! I thought she was gonna POP! Never heard of it, don’t know what channel/network. Oooooh, that dress of Viola Davis is AMAZING! I just wish she would stay away from the “smoky eye” look – it is way too dark for her fabulous skin color. 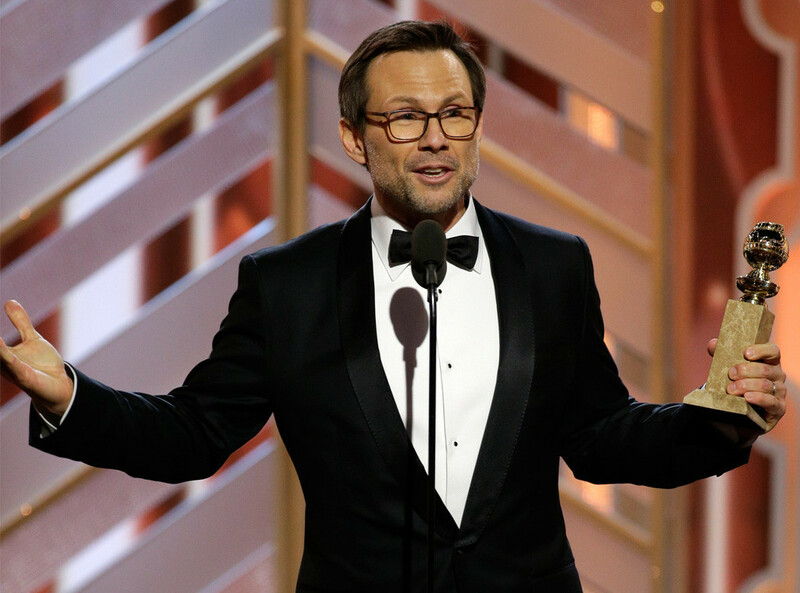 Christian Slater for Mr. Robot. He looks really good! His skin is flawless! BEST ORIGINAL SCORE – Jamie Foxx presented the award, and when he was about to announce the winner, he made a great Steve Harvey Joke (the Miss Universe fuckup) by saying that Straight Outta Compton won (HYSTERICAL) – but it was really Ennio Morricone who won for The Hateful Eight! ROTFL! Quentin Tarantino accepted for him and wonked about how Ennio is his favorite composer…I think he’s drunk. He should go home. He was super surprised to win, and really wasted…but not funny at all. More like a deer in headlights because he didn’t think he was gonna win. BEST ACTOR COMEDY MOVIE – Matt Damon for The Martian. That was a comedy? WTF? BEST ANIMATED FEATURE FILM – Inside Out! BEST SUPPORTING ACTOR IN A FILM – SYLVESTER STALLONE for Creed – 40 YEARS AFTER ROCKY! Oy his puss – his ears, his lips, and he’s as orange as an NBA basketball! I hope he’s not hanging out with Trump, but at least Sly’s eyes were done correctly instead of being white like The Donald’s eyes. BEST ACTOR IN A TV SERIES COMEDY – Gael Garcia Bernal for Mozart In The Jungle. I guess I should find and watch this thing. Lady Ga Ga for American Horror Story Hotel. Her speech made me tear up…I guess I need to see that show. BEST TV SERIES DRAMA – Mr. Robot. Uh oh, Cookie is NOT happy. Here’s Tom Hanks, presenting Denzel Washington with the Cecile B. DeMille Award! He brought his wife and kids up with him! BEST ACTRESS IN A TV SERIES DRAMA – Taraji P. Henson for Empire! She handed out cookies on her way to the stage, ROTFL! And I just LOVE how she pointed out that she won for playing an ex-convict/former Crack dealer, instead of winning for Queenie or her role in The Karate Kid – BOOM! Jim Carey? He’s won 2 Golden Globes? What’s with the buzzcut and beard? All he’s missing is a yarmulke! He’s rambling and drunk. BEST ACTRESS IN A MOTION PICTURE DRAMA – Brie Larson for… I forgot. And, you guessed it – I have NO IDEA who she is. He went on and on in his speech about the indigenous people of the planet and how we all must respect and save it. That’s cool. I haven’t had cable for about 5 years, so I didn’t know over half of the shows or the people on them. Oh well, I still can’t afford cable. 2 – I don’t see as many movies as I used to. I’ll get on that. The show was VERY BORING for the most part so I yawned a LOT. Maybe they weren’t drunk enough to be funnier! Well kids, for the beginning of award season, this was pretty much a bust – which is really surprising considering all of the booze that’s at this show. This does NOT bode well for The Oscars and other award shows. Oh well. HAPPY NEW YEAR, see you soon! The 86th Annual Academy Awards RANT! The 85th Annual Academy Awards RANT! 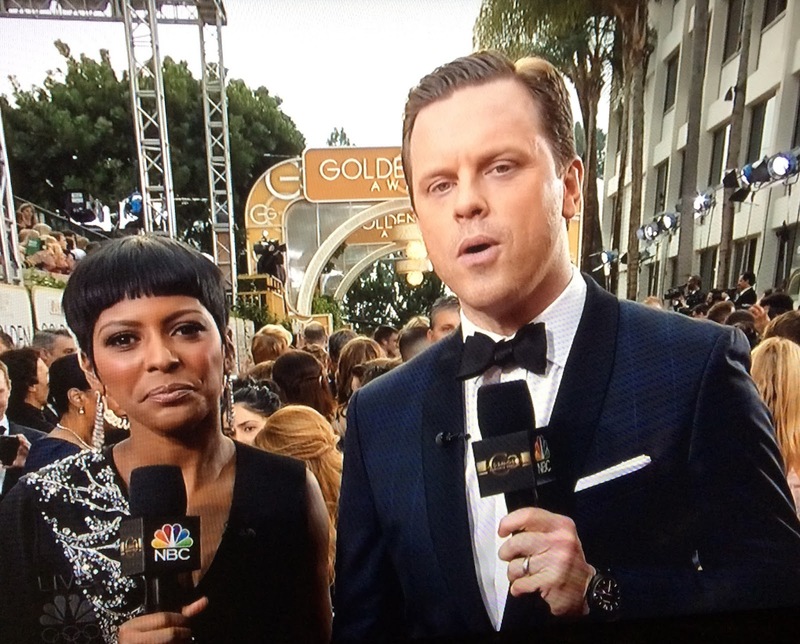 The 69th Annual Golden Globes RANT!